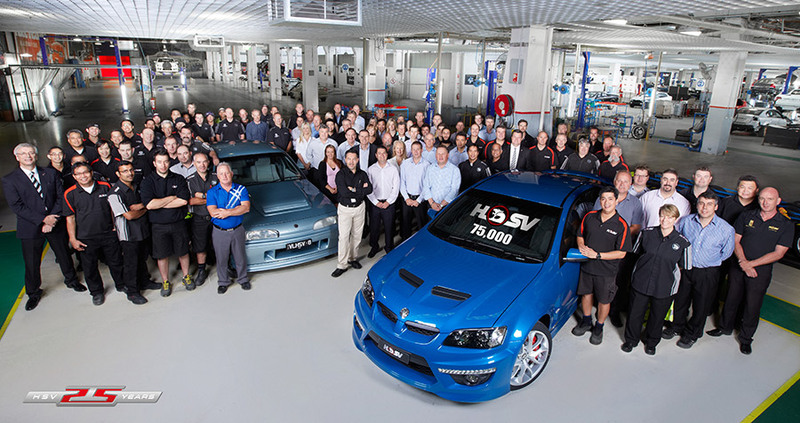 A Perfect Blue ClubSport was the honoured vehicle that rolled off the company’s production line in Clayton recently, as a commemorative photo was taken, with all HSV staff, to mark the occasion. “The build of our 75,000th vehicle caps off a memorable 12 months for our company.” said HSV’s Managing Director, Phil Harding. “In celebrating this milestone with our staff, it gave us the chance to reflect on all those who have contributed to the success this company has enjoyed over the past 25 years”. HSV’s Number 1 selling dealer in 2012, Shacks HSV in Fremantle, Western Australia, will be the lucky recipient of this special vehicle. In addition to a unique build plate marking its status, the owner will also receive a personalised letter from HSV Managing Director, Phil Harding, authenticating the vehicle. • The 5,000th HSV vehicle built was an HSV VN T30 (the forerunner to the ClubSport), built in June, 1991. • The 20,000th HSV vehicle built was a Senator, built in April, 1997. • The 40,000th HSV vehicle built was a ClubSport, built in August, 2003. • The 50,000th HSV vehicle built was a VZ ClubSport, built in July, 2006.